I have made a short trade in the US Dollar. We saw the dollar trend strongly higher for a few weeks, and then a week of downward activity. My moving average on the 60 minute chart demonstrates a downward slope. This morning the price was up against the lower side of the moving average indicating an opportunity for a short sell swing trade. Entry was made at 82.30 at 6:30 my time. Read more about swing trading on the trading strategies page. Click the link to swing trading to go there now. Here we will observe the 60 minute USDX futures chart for the June contract, which will expire in one week. The basic idea behind swing trading is to trade with the trend. We do this by identifying trend within our time frame, in this case with 60 minute charts, by observing the slope of a moving average. 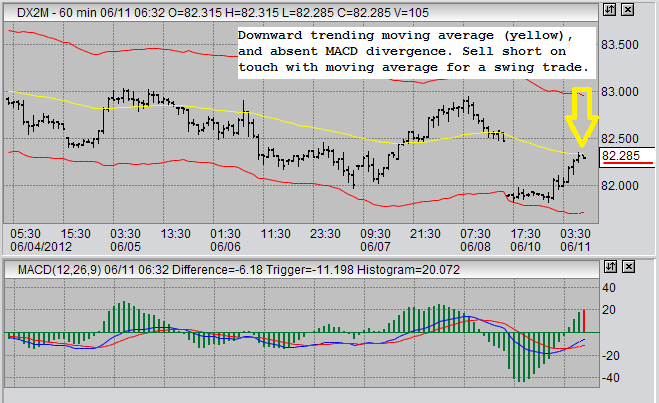 In this case the moving average was sloping downwards telling us the trend was downwards. One then waits for price to approach the moving average to trade in the direction of the trend, in this case it was a short sell trade. One then waits for price to approach an outside channel to sell at a profit. In the above chart, the red Keltner channel lines serve as my profit targets. In my mind, swing trading is kind of like the opposite of divergence trading, as divergence trading gets you trying to break trends and swing trading gets you following trends. These are the two methods that I have had the most success with trading in 60 minute and daily time frames. Often, when I'm trading this way on 60 minute charts, like I am today, a trade will not last more than a few hours and sometimes even less than one hour. To learn more about these methods go to trading strategies. As always, I have used a stop loss order in case of the unexpected in this US Dollar futures trade. In trading the unexpected loss should ALWAYS be expected! I am moving my stop (trailing it) as the trade moves in my favor. My target, in this particular case, is 81.80. If I reach that price without exiting I will be very happy, but I expect to either exit or be stopped out at a profit earlier. As I am writing this, the position is already profitable and I have already moved my stop beyond the break even point.